A premiere area vocalist and instrumentalist, Phil was exposed to musicianship at a very young age. His earliest memories are of singing and playing along with his entire family, at home and at church, a church deeply rooted in music. The “son of a preacher man”, Phil realized early on that music was, simply put, his calling. In addition to his early singing, Phil (like his father) became a skilled saxophonist, playing at local jazz clubs with veteran Columbus players when he was barely out of high school. Over time his jazz, gospel, and soul performance interests led him to also develop his piano, organ, guitar, and harmonica skills. 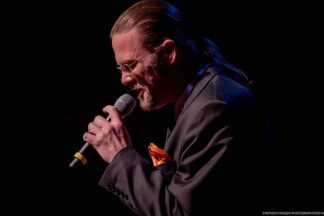 Throughout his musical career, he has brought his superb voice and instrumental talents to a wide variety of top area music events; in his work with various Columbus jazz trios and quartets, he lends a special spark to the standards, and a soulfulness and sophistication to more contemporary numbers. Phil has joined the Columbus Jazz Orchestra regularly over the years, as a guest vocalist for both their “Swingin’ with the CJO” and summer JazZoo concert series. Also very popular with audiences of, and adept at, other genres, Phil takes on frontman duties in several top area bands — including The Apostles, The Ramshacklers, and Phil Clark and The Soul — doubling on saxophone, keyboards, guitar and harmonica. Last but not least, he is a veteran horn section player and vocalist for the venerable HooDoo Soul Band.